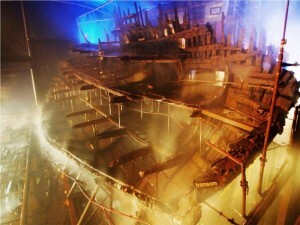 In Portsmouth, England an unprecedanted maratime salvage operation involving the Mary Rose – over 30 years in the making – is starting to come to a close. In the preservation efforts, a certain polymer has played an essential role. The Mary Rose was an English warship that sunk in 1545 during a battle on the Isle of Wright. It sunk on its side, with close to half the ship eventually buried in mud. The exposed portions of the ship were destroyed by sea life and the tides. However, in 1971 the wreck was discovered with the salvage operation taking place in 1982 with Prince Charles himself as a patron of the efforts. Starting in 1994 and concluding in 2003 the hull was saturated with low molecular-weight PEG. From 2003-2010 a higher molecular weight PEG was sprayed. The PEG segment of the project is now complete and a slow-dry has started that will end in 2015-2016 – the final stage of the project. This salvage operation will be 34 years old when completed.